Melina Marchetta is one of the most talented writers out there today. It's unfortunate her books are labeled YA, because most people miss out on her wonderfulness. But for those of us who are smart enough to read YA whether or not we're teens, we are privileged to have a truly special author in our midsts. 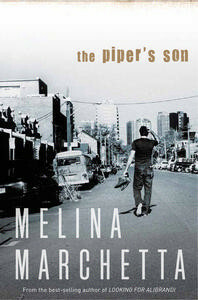 The Piper's Son would flop in the hands of most authors. Tom Mackee is grieving the death of his uncle Joe who died two years ago in a terrorist attack in London. He abandoned his friends, quit school, and spent most of his time drinking, doing drugs, having one-night-stands, and hanging with his loser roommates. His family isn't much better. His father is in the throes of alcoholism and Tom's mother left with his little sister. Tom's aunt Georgie is pregnant by her long-time boyfriend who she can't forgive for fathering someone else's child when they briefly broke up, but can't stay away from either. When Tom hits rock bottom, he moves in with his aunt, and they all try - not to recover necessarily - but to live. There's a lot going on in the history of the characters, but really not a lot going on with the plot. The book is about the love and pain of a close family and the camaraderie and anger of friends. We are re-introduced to most of the characters from Saving Francesca. I loved seeing how strong and vibrant Francesca is when she isn't depressed. She is the thread that holds everyone together. We also see Justine and Tara. I missed Jimmy - he was only briefly mentioned. Dialogue is Marchetta's specialty. It's the reason the books are enjoyable even if nothing is happening. The characters are uniformly witty and smart. Or if angry, quick to come up with a biting remark that leaves your stomach in knots. Or if in love, they have the sweetest, most insightful, passionate comments: "A thousand times yes" (makes sense if you've read the book). I could read The Piper's Son a dozen times and come up with a different quote each time that causes me to pause and think. I love how nothing is simple in this book. There is no enemy to fight. No easy solution that will make the characters happy. Rather, it is a slow process of healing in which they have to depend on each other. Tom's family is wonderful. Highly dysfunctional, but you can sense the love between them. It's so rare to read about really close families in YA. Nothing is more important to Tom than his family. The book is told both from Tom and Georgie's perspectives. The switch is a bit confusing at times, but I got used to it. It was fascinating and sad to see how one person's death could tear apart a family in so many different ways. The Piper's Son even has a shout-out to Jellicoe Road. It's easy to miss, but a fun tribute. The Piper's Son is not as complex or beautiful as Jellicoe Road and as wonderful as Tom is, he's not Jonah Griggs. However, it is an approachable novel much like Saving Francesca. As trite as it sounds...you really will laugh, cry, rejoice, rage, despair, and smile. Marchetta makes emotions leap off the page with the simple yet beautiful prose. what a wonderful review. Its a maybe read for me. And you are correct about missing out on wonderful reads if we don't dab a bit into YA novels. I've got this in my TBR pile but it's been awhile since I've read Saving Francesca and although I remember I liked it I don't remember the specifics. Do you think I'd need to reread it before reading The Piper's Son? Yea, love Marchetta! I agree - I love Jimmy, and part of me hopes that the mysterious mentions of him might mean that Marchetta may some day tell us where he's been and what he's been up to! I loved this book, and you are right - no enemy to fight here, except for the anger you hold in your heart - a wonderful story of self-love and forgiveness! Wonderful review, Alison! I have heard about this book alot and now I need to pick it up.I have read ravingn rreviews like yours but never got it. Thanks for the review! "I love how nothing is simple in this book. There is no enemy to fight. No easy solution that will make the characters happy. Rather, it is a slow process of healing in which they have to depend on each other." LOVE that:) I'm still a Marchetta virgin which is absolutely absurd and I just have no excuse for it. I'm planning on starting with Saving Francesca and then moving on to this one. I love characters so much, and it's obvious she writes brilliant ones, can't wait! AHHH! I'm so excited to read this post. I am a new Marchetta fan after reading Jellicoe Road. So glad you loved it!! Gosh this has been on my wishlist forever!!! I need to grab it!!! Ugh! Wonderful review! I really want to read this one! I can't believe I've never read a Marchetta book before. I hope to rectify this soon. "I love how nothing is simple in this book." Love this quote. I know I would appreciate that about this book too. oh interesting! I definitely have to read this one! It sounds super interesting, and Marchetta is an amazing writer. Yes, this book is more about character development than plot and I loved the complex simplicity of it too. I really need to read Jellicoe Road. I started it, but put it down a couple of months back. I'll make it a goal to finish it this month! P.S. I missed Jimmy, too. I can't believe I haven't read any of her books yet. I've been meaning to for years but somehow never got around to it. I'm making myself a note to check out her books when I'm at the library. Your review makes me want to read them ASAP! Normally books that don't have a lot of plot bore me to tears, but Melina Marchetta just makes it WORK. Her writing is truly amazing. To make this book a page turner? I don't think anyone else could have done it. Gah, I just adored it. 'Jellicoe Road' is still my fave, but 'The Piper's Son' was pretty epic-ly amazing as well. This sounds like a wonderful book, and very reminiscent of life as it is. Sometimes not a lot HAPPENS, but a lot is said and thought. Great review! I've just finished this book as well! I loved it. I do agree that Tom is no Jonah Griggs but I do have a soft spot for Tom. MM is just fantastic isn't she? I just finished this Allison and I was excited to come and read your review. I totally missed the Jellicoe Road Shout out, and will need to have it spelled out for me. You say so many things that I agree with, one of them being, this story is not as beautiful as Jellicoe Road, but it's still an amazing read. Thanks for your review! Wow this book sounds great, I think I have Jellicoe Road on my to read list but I haven't read any of the books in this series of books.